Virtual New Zealand Stamps: 2011 - Ross Dependency - Race to the Pole. This issue marks the Centenary of the first successful attempt to reach the South Pole. Over the summer season of 1911/12 two men were attempting to be the first to reach the pole. 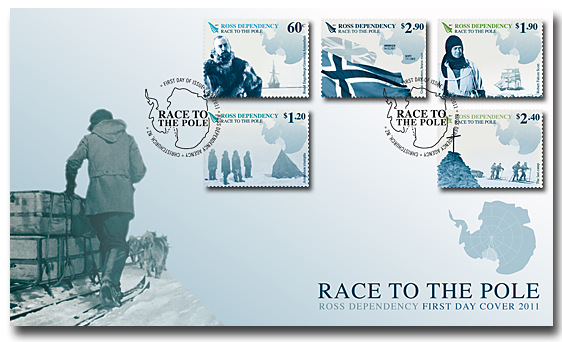 One was an Norwegian explorer, Roald Amundsen, and the other a British explorer, Robert Scott. The stamps of this issue, remember and celebrate both men and their teams. 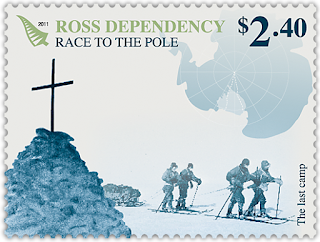 The miniature sheet titled "The Race to the Pole" including the five stamps of this issue. they were nicely laid out with interesting subjects. Roald Engelbregt Gravning Amundsen (16 July 1872 – 18 June 1928) was a Norwegian explorer of polar regions. 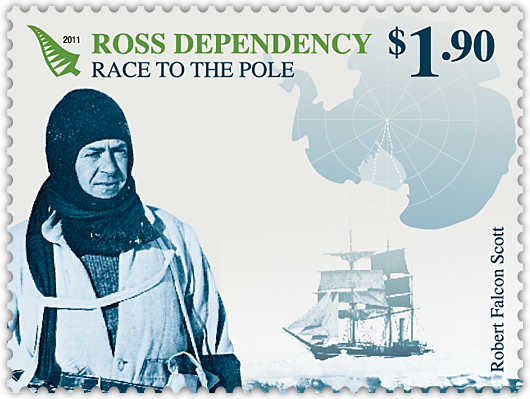 He led the Antarctic expedition (1910–12) that was the first to reach the South Pole, on 14 December 1911. In 1926 he was the first expedition leader to be recognized without dispute as having reached the North Pole. 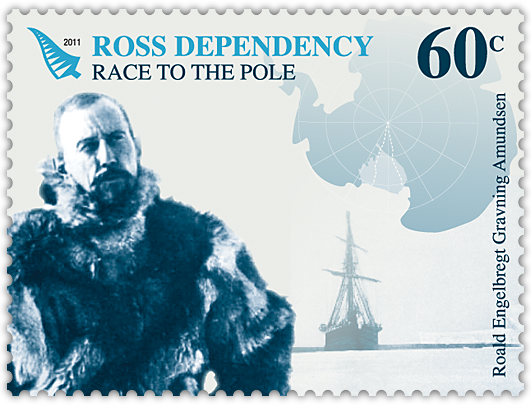 He is also known as having the first expedition to traverse the Northwest Passage (1903–06) in the Arctic. He disappeared in June 1928 in the Arctic while taking part in a rescue mission by plane. 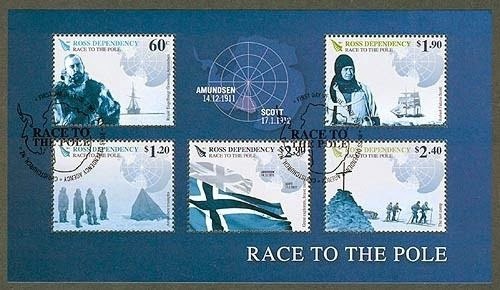 Amundsen was among key expedition leaders, including Douglas Mawson, Robert Falcon Scott, and Ernest Shackleton, during the Heroic Age of Antarctic Exploration. A team made up of Olav Bjaaland, Helmer Hanssen, Sverre Hassel, Oscar Wisting, and Amundsen, departed base camp on 19 October 1911. They took four sledges and 52 dogs intending to use some for fresh meat. Using a route along the previously unknown Axel Heiberg Glacier, they arrived at the edge of the Polar Plateau on 21 November after a four-day climb. On 14 December 1911, the team of five, now with 16 dogs, arrived at the Pole (90° 0′ S). They arrived 33–34 days before Scott’s group. Amundsen named their South Pole camp Polheim, meaning "Home on the Pole." Amundsen renamed the Antarctic Plateau as King Haakon VII’s Plateau. They left a small tent and letter stating their accomplishment, in case they did not return safely to Framheim. The team returned to Framheim on 25 January 1912, with 11 surviving dogs. They made their way off the continent and to Hobart, Australia, where Amundsen publicly announced his success on 7 March 1912. Captain Robert Falcon Scott, CVO, RN (6 June 1868 – 29 March 1912) was a British Royal Navy officer and explorer who led two expeditions to the Antarctic regions: the Discovery Expedition, 1901–04, and the ill-fated Terra Nova Expedition, 1910–13. On the first expedition, he set a new southern record by marching to latitude 82°S and discovered the Polar Plateau, on which the South Pole is located. During the second venture, Scott led a party of five which reached the South Pole on 17 January 1912, only to find that they had been preceded by Roald Amundsen's Norwegian expedition. On their return journey, Scott's party discovered plant fossils, proving Antarctica was once forested and joined to other continents. At a distance of 150 miles from their base camp and 11 miles from the next depot, Scott and his companions died from a combination of exhaustion, starvation and extreme cold. $2.40 - The Last Camp. A cairn of snow was erected over the tent and the bodies, with a simple wooden cross set on top. A century of storms and snow have now covered the cairn and tent, which are encased in the Ross Ice Shelf as it inches towards the Ross Sea. It is estimated that the tent with the bodies was under about 75 feet (23 m) of ice and about 30 miles (48 km) from the point where they died; it is speculated that in about 275 years the bodies would reach the Ross Sea, and perhaps float away inside an iceberg. $2.90 - Great Explorers / Brave Men. Now one hundred years later we look back and can only be amazed at what they endured in their quests to be the first to reach the South Pole. 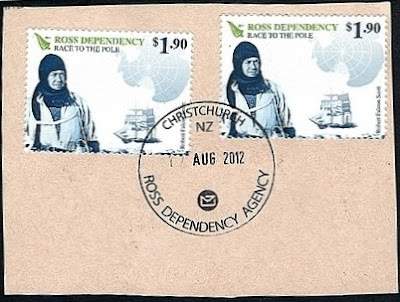 Stamps on piece cancelled in August 2012 at the Christchurch Ross Dependency Agency. 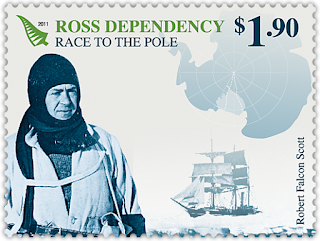 2011 - $1.90 Captain Scott - The Race to the Pole. 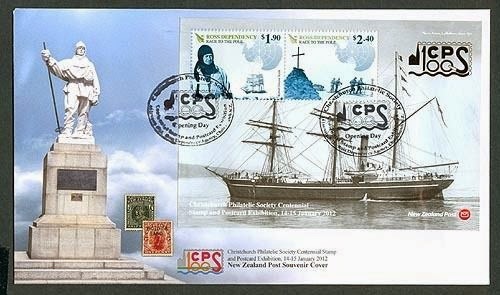 2011 marked the centennial of the Christchurch Philatelic Society, however plans for an exhibition in November 2011 had to be postponed due to earthquake damage at the chosen venue. 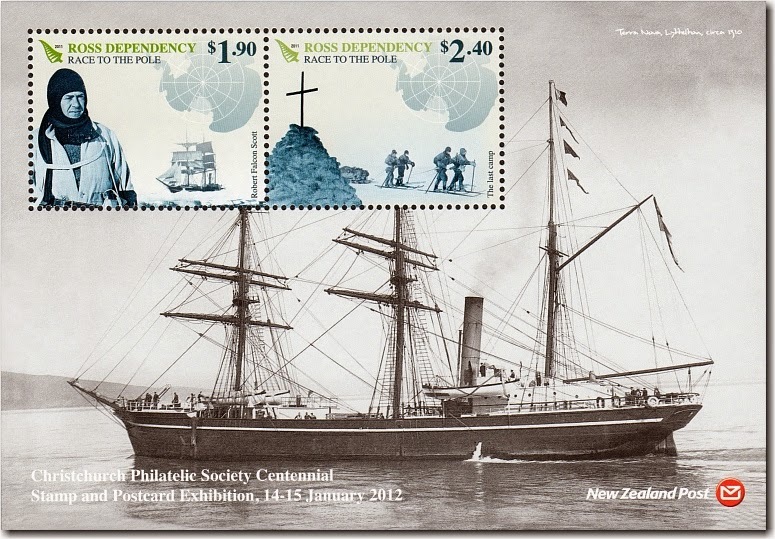 The exhibition was held on the 14th and 15th of January and was themed around Robert F Scott's expedition to the South Pole which used Lyttelton and Christchurch as a base. The miniature sheet shows Scott's vessel, the Terra Nova in Lyttelton harbour. 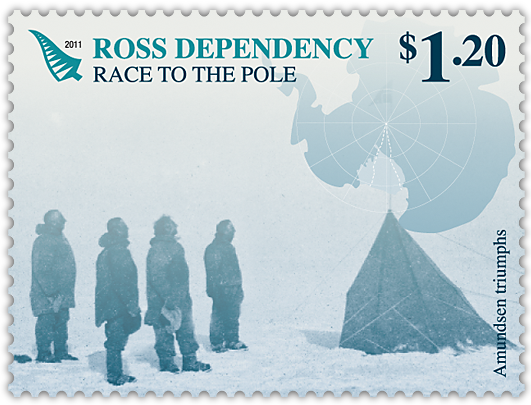 The stamps are from the 2011 Ross Dependency Issue showing Scott with his ship and Scott's last camp showing the cairn of snow built over the tent and bodies. The exhibition souvenir cover features the Scott statue that toppled off its plinth in the February 2011 Christchurch earthquake, but remounting is planned. 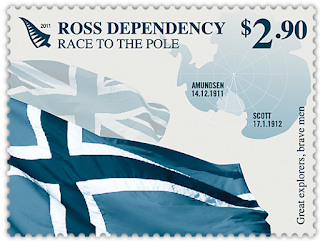 Also printed on the cover are New Zealand ‘Penny Dominion’ and ‘Edward VII’ ½d stamps. Scott was appointed Post Master for the expedition and supplies of both stamps were overprinted ‘Victoria Land’ for use by expedition members.